Receives a sequence of data bits, performs MSK modulation, and returns the modulated complex baseband waveform in the output complex waveform parameter. If you use the finite impulse response pulse-shaping filters in modulation nodes, it may lead to the apparent loss of bits caused by filter delay. Refer to Filter Delay in the Details for more information about this effect. Set the flush buffers? parameter to TRUE to offset the effects of filter delay in single-shot operations or in the last iteration of continuous operations. The sequence of information bits to be modulated. Parameter values defining the MSK system. Wire the MSK system parameters cluster of MT Generate MSK System Parameters to this cluster. Do not alter the values. A value that indicates whether the bit sequence is differentially encoded. The desired symbol rate, in hertz (Hz). An ordered array containing the desired pulse-shaping filter coefficients. Wire the pulse shaping filter coefficients parameter of MT Generate Filter Coefficients to this parameter. When generating the filter coefficients, ensure that the value of the pulse shaping samples per symbol parameter of MT Generate Filter Coefficients is equal to the value of the samples per symbol element of the MSK system parameters cluster, which is passed to this node. When you configure reset? to TRUE, there is a transient response of half the filter length at the start of the modulated signal, and the returned output data is shortened by approximately half the filter length. When you configure reset? to FALSE, the node uses data from the previous iteration to eliminate the transient. A Boolean that determines whether the node continues modulating using the previous iteration states. The node resets on the first call and when you configure reset? to TRUE. You must configure reset? to TRUE the first time this node is called and whenever you want to restart the modulator. A Boolean that determines whether samples are forced out from the modulated waveform that are affected by the FIR pulse-shaping filter delay. Set this parameter to TRUE during single-shot operations and during the last iteration of continuous operations. Time of the first value in the Y array. Time interval between data values in the Y array. The array of mapped symbols before pulse shaping is applied. The real portion corresponds to the carrier frequency offset of the mapped symbol, and the imaginary portion is zero. If the length of the pulse-shaping filter is less than or equal to one symbol, the MSK signal is a full-response MSK signal. If the length of the pulse-shaping filter is greater than one symbol, the MSK signal is a partial-response MSK signal. For partial response MSK signals, the node assumes a history of symbols before the start of the output modulated signal. The number of symbols in history is equal to L-1, where L is the length of symbols of the pulse-shaping filter. The symbols in history correspond to an all-zero bit sequence modulated with the appropriate parameters. The initial state for all samples in an FIR filter is 0. The filter output until the first input sample reaches the middle tap (the first causal sample) is called the transient response, or filter delay. 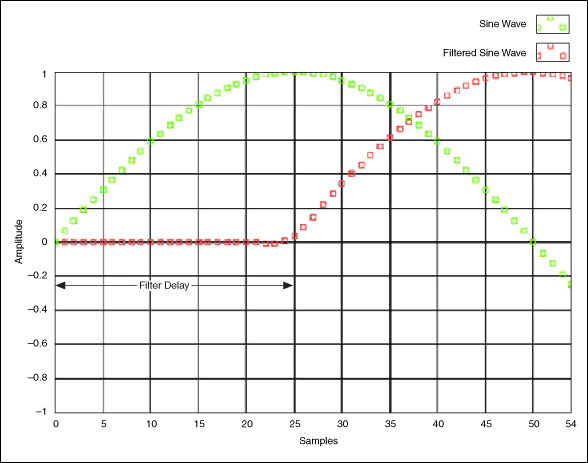 For an FIR filter that has N taps, the delay is (N-1)/2 samples. This relationship is illustrated in the following figure, where a sine wave is filtered by an FIR filter with 50 taps. In single-shot operations for modulators and demodulators, the filter delay is truncated before the signal is generated because these samples are not valid. Some samples at the end of the block do not appear at the modulator or demodulator output, and hence appear to have been lost. The N extra samples are obtained by repeating the last sample value of the input signal N times to ensure signal continuity.